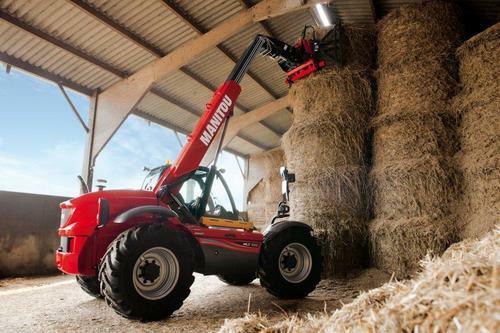 The Manitou Group constantly adapts its range of products to the requirements of farmers and the newest product in the range, the MLT629, which has replaced the MLT 627 further enhances the Manitou brand’s range of compact and high-performance solutions. True to its engine-procurement strategy, which combines “performance/usage”, Manitou has chosen a Perkins engine for the MLT 629 in response to a requirement for compact design and performance in the compact telescopic forklift sector. For a smooth performance, the MLT629 has engine torque that is amongst the most efficient: 420 Nm at 1400 rpm. The dashboard with digital screen gives intuitive access to all the information that is essential, while the JSM single joystick is provided for ease of use and complete control of the machine. Exclusive to Manitou, the Manitou JSM allows control of all movements with one hand safely and effortlessly: raising and lowering the boom, crowding and tilting, auxiliary service for operating attachments and also forward/reverse direction of travel. This allows you to always keep one hand on the steering wheel whilst maintaining full control of the MLT. Although the MLT629 is a compact machine the cab is spacious with an ergonomically designed driving position for maximum comfort. Low noise levels are achieved through the full soundproofing of the cab and the insulation of the engine compartment. Three levels of finish are available Classic, Premium and the Elite. This top of the range spec includes pneumatic cloth seat with active suspension, Bluetooth car radio, air conditioning and boom suspension. The MLT629 is available with 20” or 20” compact tyres (low profile cab) for a more compact design, and also in 24 version. “The MLT 629 meets the requirements of a large number of users for compact design and performance. Ideally suited to work in the courtyard of a farm, its excellent visibility is a significant safety feature, combined with a high-performance engine torque for maximum productivity. The design of the MLT629 is based on ‘field experience’ incorporating the expertise and quality of the MANITOU brand.” Explains Paul Bidwell Marketing Manager Manitou UK Ltd.